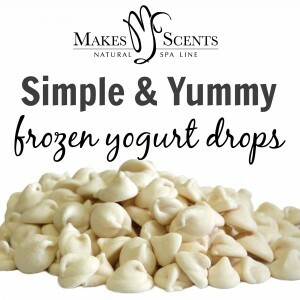 The next time your sweet tooth kicks into overdrive try this amazing and simple recipe for frozen yogurt drops. They are healthy, high in protein and super easy to make! Spoon yogurt into plastic bag. Cut corner of bag making an opening the size of a pencil. Squeeze dots onto cookie sheet and place in freezer. Yogurt dots will be ready in about an hour! Frozen Pumpkin Spice Yogurt Drops: Add 2 Tbs. of organic pumpkin puree, seasonal spices (cinnamon, clove, allspice and/or pumpkin pie spice) and 2 Tbs. of honey to one cup of plain yogurt. Mix well and follow above steps. Frozen Chocolate Peanut Butter Yogurt Drops: Add 1 Tbs. of natural peanut butter to one cup of plain organic yogurt. Mix well and follow above steps. Prior to freezing, add organic dark chocolate shavings to top of drops. Frozen Fresh Fruit (FFF) Yogurt Drops: Add 1/2 cup of fresh fruit (pineapple, blueberries, peaches) along with one cup of organic yogurt in a blender or food processor. Blend well and follow the above steps. What are your favorite frozen yogurt variations? We would love to hear from you below!